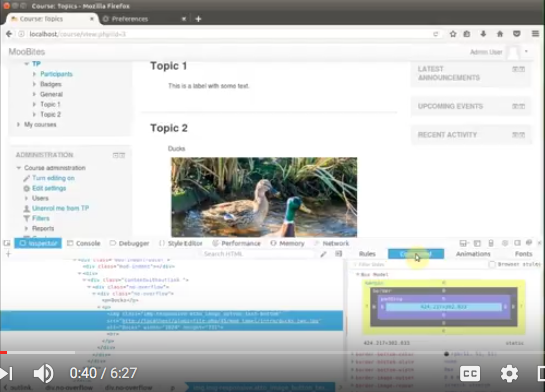 This movie provides an overview of the some of the main browser developer tools available for Moodle Theme designers. The movie is created by Gareth Barnard, Moodle Theme guru, and maintainer/developer of the Essential, Shoelace, Shoehorn, and Campus Themes. This movie is taken from our 100% online facilitated MoodleBites Theme Design course (outline here). Best of all, Gareth is the facilitator of this course, so there is a lot more you can learn from the master himself ! If you have any movies in particular you would like us to develop, just reply to this post with suggestions, and we will see if it fits in with our course design and updates, and if it does we might just make it ! Free Mobile MOOC course ! Thanks for sharing these movies for free !